* AI : Updated cars icons. * GRAPHICS : Updated Rims & Tires specular. * GRAPHICS : Added position plates. * GRAPHICS : Corrected crash in showroom. * PHYSICS : Rear wing steps passed from 10 to 20 to allow more finetune in setup. * PHYSICS : Brake power and balance adjusted. * PHYSICS : Some aero finetunes. * The Flat6 series has to be driven with degressive braking technics like in real race cars. * The Flat6 Series has no driving help (NO ABS, NO Traction Control). They are disabled in the mod. * The cars has been beta tested on several hardware and driving wheels brands (Logitech G25/27/DFGT, Thrustmaster T300/T500, Fanatec ClubSport) and is calibrated to work with all. * If needed you can adjust FFB power using the FFB Upgrade in game tuning options of the car. * Engine: 3,797 cc; stroke 76.4 mm; bore 102.7 mm diameter. * Power: 450 hp at 7,500 rpm. * Max RPM: 8,500 rpm. * Gearbox: Six-speed sequential dog-type gearbox (G97/63) with active oil cooling and pressure-oil lubrication. * Brakes: Aluminium six-piston calipers, in red at front, 380mm. Aluminium four-piston calipers, in red at rear, 355mm. * Suspension: McPherson strut-type axle, height-adjustable. * Tank capacity: 100 Liters. 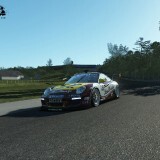 The Flat6 Series rF2 build 1.00 for rFactor2 as standalone mod is now available ! The Flat6 GT3 cup car is featured with a high detailled quality model, with lot of details and accuracy for a perfect immersion like in the real car. The cockpit is full of details, the most beautiful paint shemes from the series around the world from the years 2010 to 2013 are included. The car comes with 2 types of sounds, several types of rims. The move over rF2 allows more features to be included, such as animated driver, deformable tyres, advanced physics and tyres behavior, and of course a complete refreshment of the reflects, lights and shadings compared to the rF1 version. * Graphics : High fidelity 3D model, with high definition cockpit. * Graphics : 50 paints shemes inspired from the real cars. * Graphics : Highly improved car materials, live reflections, dynamic lightnings and shadings. * Graphics : Animated car driver, with high definition 3D Helmet. Special thanks to Coutie for the job. * Graphics : Car details with backfire, headlights with Some1 lens flares shaders. * Physics : Accurate car physics, created in collaboration with Gentlemen Racers physics team, with help from real teams and drivers. * Physics : New rF2 deformable tire model, without CPM (still in development). * Physics : Ultra chassis technology. * Physics : Aero updated to match to rF2 improvements. * Physics : FFB adjustment to match to rF2 engine. * Physics : Suspension geometry improved. * Physics : Rain tires. * Sounds : Accurate and detailed sounds. * Sounds : Up to date rF2 sounds features. * Tire new CPM model. * Damage fine tuning (Need deformations not yet implemented in rF2 to calibrate realistic damage values). * Animated wipers in cockpit. * The Flat6 Series has no blip, you need to make heals/toes technique on braking/down shifting phases. Feels great to be driving an Enduracers mod in rF2 at last. Thank you to all in involved. Thank you GrimDad, Merry Christmas too. 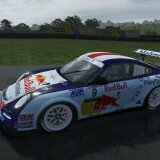 * Corrected body layers, including number plates and sponsors. * Updated windows template, including banners, driver names, numbers and country flags. * Updated windshield template, in 2048*2048 high resolution, including banners, driver names, numbers and country flags. * Pack of fonts to be used for driver names and numbers. * GRAPHICS : Added New bodywork shader. * GRAPHICS : Added New rims shader. * GRAPHICS : Improved Windshield texture quality. * GRAPHICS : Improved Motec writtings quality. * UI : Added New UI background design (coming in a separate file). * PHYSICS : Update of tires (understeer in front tire fixed). * PHYSICS : Downgrade of performance (to reduce and back to laptimes closer than Cup). * PHYSICS : Addition of Auto Blip Upgrade (Off by default). * PHYSICS : The old setups are not compliant with new physics. * PHYSICS : Update of AI performances. EnduRacers Modding Team & Gentlemen Racers are pleased to provide to you the Flat6 Series rF2 build 4.00 ! The build includes a complete graphic refresh, including the step into DX11 shaders. The team has implemented all the rain features, recently released by Studio 397, together with the animated windscreen wiper. Some other graphic updates have been included, such as blurred rims and a new headlights rendering. The team used this opportunity to add in this build a physic update, with in particular the introduction of CPM tires technology. This modification has driven an update of all cars defaut setups, so please be carefull with your current setups before making some feedbacks. Don't forget to read carefully the instructions to install and setup correctly the mod. * GRAPHICS : Updated headlights rendering. * PHYSICS : Integration of CPM tires (Slick & Rain, around 90°C usage temperature for Slicks) adapted from S397 reference tires. * PHYSICS : Upgrade autoblip removed (the real car don't have autoblip). EnduRacers Modding Team & Gentlemen Racers are pleased to provide to you the Flat6 Series rF2 build 5.00 ! The build includes an important update of the physic behavior of the car, including the last specification of the CPM tires, based on the S397 Endurance pack DLC. The aero, braking behavior and the FFB have been updated too. We cured the issues encoutered with the AI cars. We took the opportunity to add the position plates on the cars, and update all cars icons. A new build will come when the new shaders system will be made available to modders.